The following charts provide both a long and short guide on the future direction of U.S. stock prices. After 12 years of a bear market most assume that we have now begun a new secular uptrend. But are we at the valuation levels where new bull markets begin? Did we reach those levels at the 2009 bottom? The first chart shows the price to earnings ratio going back to 1880. The historic average is at 16 and bear market bottoms usually occur in the mid to high single digits (see 1982). We touched slightly under the long term average during the March 2009 low coming no where close to true capitulation, then rocketed back up to extreme overvaluation where we still find the market today. We are much closer today to the point where the market peaked in 1966. Secular bull and bear stock market cycles tend to last 17.6 years. For a discussion on this 17.6 year cycle see Historical Guides: Stock Market Cycles & Public Ownership. That would give us about 4.3 years remaining in this bear market. Will this bear market end with stocks once again at extreme under valuation and true P/E ratios in the single digit range? Or will this time be different? In order for these record breaking profits to continue their epic levitation, you will need an endless rise in earnings growth. That is exactly what Wall Street has put on the table for estimates moving forward. 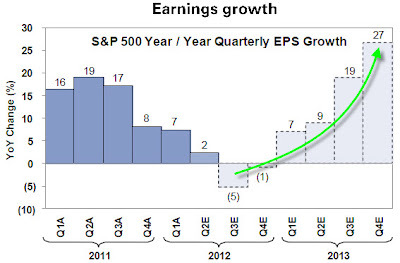 Current estimates, seen in the parabolic chart below, have earnings rising 27% year over year moving forward. Analysts have completely brushed aside any concern over the January 1 tax increases, the potential sequestration cuts in government spending, gasoline prices surging, and consumer sentiment plunging. They see these as catalysts for the coming earnings surge. We are now hearing a steady stream of calls for DOW 15,000.....17,000....and 20,000 as the new bull market has "just begun." As I mentioned earlier this week as the S&P 500 and the price of gold were close to touching each other at the mid 1500 range, it represents what I consider one of the best long/short pair trades available (long gold & short the S&P). 2013 Outlook: Should I Buy Stocks Today?